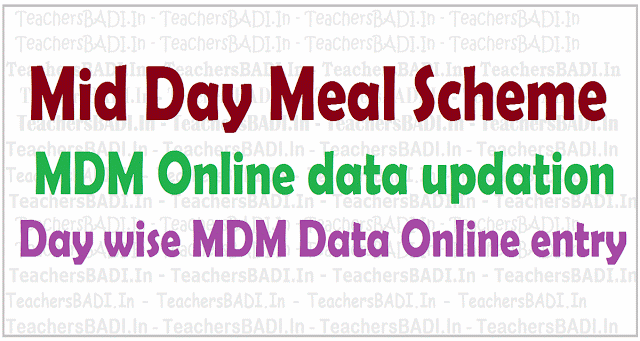 Sub:· School Education Mid Day Meal Scheme Data entry of Mid Day Meal Scheme through online Explanation called lor Reg. All the District Educational Officers in the State are hereby informed that they have not made efforts to get the data entry into MDM portal by the MEOs of their district by 16.12.2016 even though several instructions are issued from time to time and the data for completing is extended from 15.12.2016 to 17.12.2016. This is causing difficulty to the Directorate to furnish data to the Government. Therefore, they are hereby directed to submit their explanation why action should not be taken against them for failure to complete the assigned work. All the Mandal Educational Officers in the district are hereby informed that in the reference cited, the Director of School Education, TS, Hyderabad has communicated a Proforma (enclosed) for online data updation of MDM data of each and every school for the month of November, 2016 i.e., from 01.12.2016 to 31.12.2016.
a. Day wise detailed voucher for serving MDM programme. 2. Submit the data in the link provided in the website for the month of November, 2016 in the prescribed Proforma day wise of each school in the mandal by 04.12.2016 and online the data every day from 01.12.2016. 3. The Mandal Educational Officers are requested to take necessary action in this regard without fail. The Director of School Education, TS, Hyderabad is observing the day wise data. 1. First visit the MDM Online data updation web portal and LOGIN with your username and password. For Accessing MEO's Portal select the District, Mandal & Enter the Password in given fields. 2. Now, the web page contains following links..
4. COOK details: Now click on cook details link and For Accessing COOK details, select the District, Mandal & Enter the Password in given fields. Select the School to continue, Select School to Enter the BANK details of Cooking Agency and Select School from given drop down menu. 6. ADD SCHOOL: Enter the SCHOOL to ADD the SCHOOL UDISE. 1. Opening balance Entry, Annual Entry, Monthly Entry data would be uploaded on Online. 2. Mid Day Meal online entry Proforma for HMs to be sent to MEOs by 4th December, 2016.